The revival of Khorezm and its capital city, literally from the ashes, is connected with name of its Golden Horde governor - General Kutlug Timur (1321-1335) and his wife, Turabek Khanym. 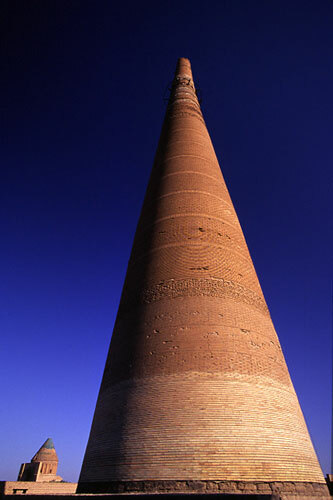 The Minaret of Kutlug Timur is the tallest minaret in Central Asia. Its height is 62 m, and is decorated with bands of brick and a few remaning turquoise tiles. This is one of the more impressive points of Kunya-Urgench. 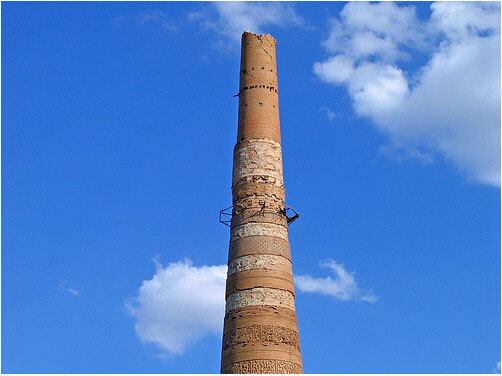 A structure of the Minaret of Kutlug Timur original age and name are the subject of scientific controversy. It has been supposed that its construction began in the 11th century, during the rule of Khoresm Shah Аbu-Abbas Mamun. For unknown reasons, construction was interrupted for a very long time, and was completed only in 1321-1336, in the time of Kutlug-Timur (the vice-regent of the Golden Horde). It is well-proportioned and tapers upwards along toward the peak (diameter at base is 12 meters; at the top - 2m). The "trunk" is divided by narrow belts of vertically stacked bricks, which create specific architectural rhythms and are inlaid with wide bands of Arabic inscriptions. In the past, the Minaret was crowned by a wooden lantern, from which the brickwork supports remain. A spiral staircase of 145 steps leads to the lantern, though access to the stairs was only possible from the roof of the neighboring mosque, which unfortunately no longer exists. Several years ago the plinth of the Minaret and its surroundings were entirely restored. The UNDP Project has assumed the preservation, i.e. reconstruction work of its dangerous top, which represents a very complicated engineering task, owing to the fact that personnel must work at the very summit, without scaffolding!